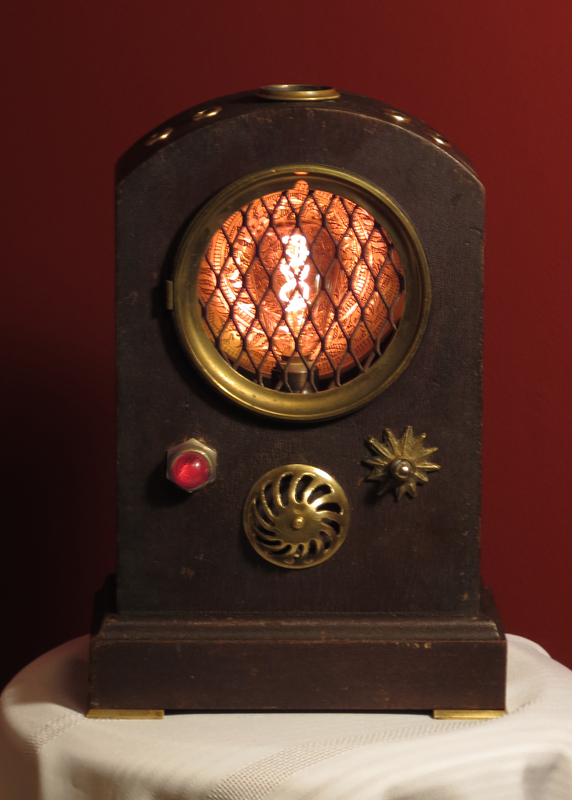 This lamp looks rather like an antique radio – it is, however, made from a vintage clock case plus various bits and pieces that have been lying around waiting for inspiration. The clock case has the shape of an antique radio and has a nice crackle finish which is perfect for the piece in an imperfect way (if you know what I mean). The insides have been removed and replaced by a reproduction Edison bulb backed by a vintage brass dish used as a reflector. The original brass bezel has been used but the clock dial has been replaced by a grill to make it look like a radio speaker. Just to add a bit of whimsy, there is a lens from an antique pair of opera glasses embedded in the top of the case that projects and magnifies the filament of the Edison bulb onto the ceiling. As well, the row of holes on the top not only give off a soft glow, but also project rays towards the ceiling to give a very interesting overall effect. Sure to become a focal point in your decor! Note that the bulb is changed by removing the brass dish on the back. All electrical components are new and UL certified. Comes with a candelabra base socket, 25 watt filament bulb as shown and approximately 6 ft of black-coloured vinyl cord with an in-line on/off switch.